Magic Crusade RPG Mods was made to create a kind of RPG gameplay in Minecraft; adding NPC, dungeon, classes (rogue, hunter, mage…), spells, mana / vigor / fury, and a loads more. 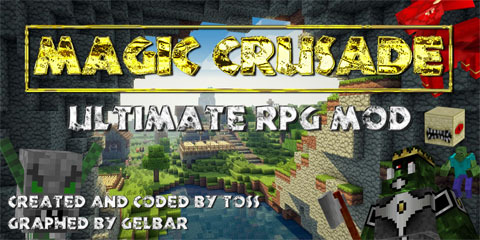 Put the jar file of Magic Crusade RPG Mods into mods folder and then run Minecraft. Done! How do you get out of a dungeon on my server?????????????????? (I get in by walking through the portal, get into the lower level of where the zombies are and in front of the wall full of clocks. The whole e dungeon is up in the air. Saw three questions asking this here, no answers. googled this for two months now no answer anywhere I can find. can’t be the only one asking this? killed every mob, found all chests, try to jump to get back to my dimension where my house is – die every time.